Spokesperson for Secretary-General Ban Ki-moon, Stéphane Dujarric briefs the press. “The Secretary-General continues to closely follow the situation in Ukraine,” Mr. Ban’s spokesperson, Stéphane Dujarric, told reporters in New York, adding that since the beginning of the crisis, the UN chief has urged all parties to avoid “hasty steps” that could exacerbate tensions. “He encourages all parties to work for a solution that is guided by the principles of the United Nations Charter, including respecting Ukraine’s unity and sovereignty,” said Mr. Dujarric. 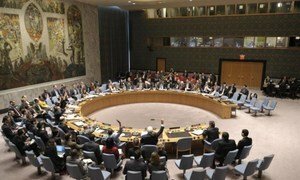 The statement comes in the wake of an urgent meeting of the UN Security Council on Saturday, at which the 15-nation body was blocked from adopting a resolution urging the international community to affirm Ukraine’s national borders and declare the referendum in Crimea invalid, owing to a “no” vote from Russia, a permanent member. China – who is also a permanent member, along with France, United Kingdom and the United States – abstained in the vote. Media reports suggest that voters in Crimea overwhelmingly supported leaving Ukraine and joining Russia. The referendum caps months of political unrest, triggered by the Government's decision last November not to sign an agreement on broader European integration. The Ukrainian capital, Kiev, erupted in violent demonstrations and street clashes in late January, culminating with the removal by Parliament of President Viktor Yanukovych. Tensions mounted in the Crimea region, where additional Russian troops and armoured vehicles were reportedly deployed. In his statement today, the Secretary-General condemned the violence which occurred over the weekend in eastern Ukraine and which resulted in injuries and loss of life on all sides. The UN chief also urged all parties in Ukraine and those with influence to avoid any steps that could further increase tensions. “Above all, the Secretary-General urges all concerned to intensify their efforts and engage constructively toward a peaceful solution to this crisis, with the aspirations of all the people of Ukraine foremost in mind,” said Mr. Dujarric, adding that Mr. Ban remains ready to work with all parties to resolve this situation.